When we received an invite to interview the one and only Robbie Williams about his new biography Reveal, we did more than just pinch ourselves. As any original ‘Thatter’ will understand, we couldn’t wait to get our hands on a preview of the book to see what Rob really has to say about bandmates Gary Barlow, Mark Owen, Howard Donald and Jason Orange. And, more importantly, meeting Rob in person meant we could find out once and for all whether he’ll be joining Take That for a 25th Anniversary tour. On February 13, 1996, Robbie turned 22, but it was also the date millions of Take That fans around the world will Never Forget (pun intended) – the day our favourite boyband split. Twenty-one years down the line and it’s good to see that the cheeky chap from Stoke had come full circle – from being in a hugely successful boyband followed by his own solo success, to marrying the love of his life, Ayda Field, with whom he has daughter Teddy, five, and son Charlie, three. After all, Everything Changes, right? I proposed to her on the exact same spot that I set eyes on her, which actually is a lie because that was Google, by myself. What did you first think when you saw her on Google? I thought she was really, really hot! Incredibly attractive and voluptuous… her personality surpassed her looks. I have lacked on the romance front for a bit. If I said to you on your birthday, ‘Happy Birthday babe,’ gave you a kiss and flowers, would that suffice? YES, if it was from you! Do you try to be romantic? Of course. I’m very tactile. If we’re in the room together we’ll be touching – not in a suggestive way, but we’re all over each other all the time. That’s where I excel. There were the years where I was going around being a pop star , thinking, ‘Do I want to be in a relationship?’ and what was missing a lot of the time was a shared humour. Ayda is smarter than me and I’m just in awe of how she makes me laugh. Did you think you were still destined to be single when you met Ayda? Yeah, that’s why our relationship didn’t kick in straight away, because one of my commandments was, ‘Thou shalt not be married or in a relationship.’ I didn’t feel like I was capable and I thought anybody to pick me would be insane… but here I am 10 years later with the woman I love. If you were single today, would you be on Tinder? No I’d go on Raya, the dating app for people with lots of followers, so you have to be popular. There are a lot of famous people on there… I can’t [say who’s on there]. I really want to, but I can’t. I think that’s just as well, as I got off my head in so many places and the paparazzi just weren’t there. There weren’t any phones, just word of mouth, but no proof. It meant I got to live a normal-ish life. Do you still get actual fan letters in the post? Not many. Do I miss it? No. I find it weird when it comes to the house. There was some real dark stuff I don’t want to mention, but it’s invasive and unsettling. Can you still do the normal things like go to the corner shop? it traumatic. I always go out wearing a hat and glasses. What about a film of your life? Yeah. I’d like to play me, I don’t know who’d play me when I was younger. I’ve got an idea for a film, I’ve started to talk to people and I’ve got an idea how I’d like it to go. You say in the book that a Take That reunion ‘didn’t seem quite as enticing’ without all five members. Can you have a word with Jason? It’s all down to Jay. Whenever I speak to him it’s by email, it’s twice a year and I’ll say, ‘Hey mate, this happened and it reminded me of you and I’m sending love.’ I don’t ask him to do Take That stuff. Gary said it’s an ‘open door’ to come back whenever – have you ever been tempted to just rock up to a gig? Nah. I’m in if it’s a five-piece… I’ll probably be in it if isn’t [a five-piece] to be honest. That said, that’s not on any calendar for the next five years… maybe. It’s definitely not happening in the next two to three. Eek! We did the maths: Four years from now is 2021, the 25th Anniversary of Take That’s split]. So if you re-join, would you still want your solo segment in the show? No, I wouldn’t. I had a break from performing live and it was great to be able to hide in public. I’d lost my confidence to get on stage, so it gave me that back. Would you like all of you to have a solo section at a TT gig? Yeah. I’m a big fan of Mark’s stuff and a massive fan of Gary’s – it would be a perfect gig. When you perform, do you still struggle with nerves? Yeah. There’ll shows where I go on stage and it’s a breeze, then there’ll be a couple of months where I’m scared. I know I’m brave as the audience can’t tell what’s going through my mind. So, what is going through your mind on stage? I need to know exactly what I’m doing every second. It might not look as though I know what I’m doing, but it’s always about the next thing – and the pose! What about when you’re dangling over a crane? On this particular tour I had to do a song called I Love My Life, which is about the kids, and what I was thinking was, ‘F**k, they know the words!’ and also, ‘Where’s the autocue?’ My brain can’t retain information. I wouldn’t be able to sing Let Me Entertain You now, I wouldn’t know the words. Have you still got any of your old Take That costumes? Which one would you have liked me to have? Something from the Do What You Like video with the jelly? Yeah, I was going to say that. Howard’s codpiece. No, I haven’t. What, to wear for herself? Yeah! She obviously loved it as much as I did. Reveal, the official biography of Robbie Williams, by Chris Heath, is out now (£20, Blink Publishing). 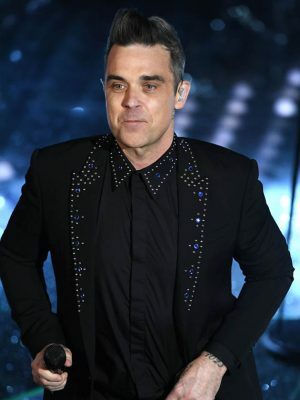 The post Robbie Williams: ‘I’ll rejoin Take That – with or without Jason!’ appeared first on CelebsNow.